Researchers at University of Leeds in the U.K. have developed a way of treating dental decay that reverses the damage caused by acid and re-builds teeth, without drilling. The technology developed at Leeds has been licensed to a company in Switzerland for commercialization. Dental cavities are caused by a process that begins with bacteria, which are normally present in the mouth, but can convert foods, especially sugar and starch, into acids. Bacteria, acid, food debris, and saliva combine in the mouth to form a sticky substance called plaque that adheres to the teeth. Plaque begins to build up on teeth soon after eating, which if not removed thoroughly and routinely, will result in tooth decay. As the decay progresses, very small pores in the teeth increase in size and number. Eventually the damaged tooth may have to be drilled and filled to prevent toothache, or even removed. 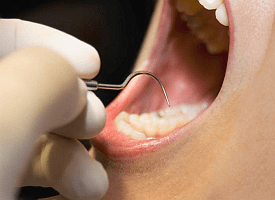 The thought of drilling is enough for many people to delay visiting the dentist when they need treatment, which only makes the dental problems worse for many patients. Jennifer Kirkham of the University of Leeds Dental Institute has led development of a new technique to break this cycle. Kirkham and colleagues have developed a a peptide-based fluid that is literally painted onto the tooth’s surface. The peptide technology is based on the natural process of forming teeth and stimulates regeneration of the tooth defect. The fluid, devised by Amalia Aggeli and chemistry colleagues at Leeds, contains a peptide known as P11-4. Under certain conditions, P11-4 will assemble into fibers. When applied to the tooth, the peptide fluid fills the micro-pores caused by plaque and then spontaneously forms a gel. The gel then provides a framework that attracts calcium and regenerates the tooth’s mineral from within, providing a natural and pain-free repair. The researchers tested the technique on a small group of adults whose dentist had spotted the initial signs of tooth decay. The results from this small trial, say the Leeds team, show that P11-4 can indeed reverse the damage and regenerate the tooth tissue. The trial was funded by credentis ag in Windisch, Switzerland that licensed the P11-4 technology from Leeds last year. The company completed start-up and early-stage financing in February 2011. The oral troubles are the most horrible difficulty of the body in this the casualty is not even to eat or drink any things the problems are of various type like teeth sensitivity, sore gums, teeth cavity, oral cancer and many more things.